Remove the skins from the chorizos and cook the sausage filling in a medium-sized pot over medium heat for 5 minutes. Add the bell peppers, garlic and onion, and cook for 4 additional minutes. Add the rice and stir until the grains are incorporated in the mix. Add 1 1/2 cup of chicken broth, cumin and salt. Let boil and when the rice begins to dry out, cover the pot and cook for about 20 minutes, until the rice grains are split open. Add the cooked beans, fried plantain and coriander, and stir well. 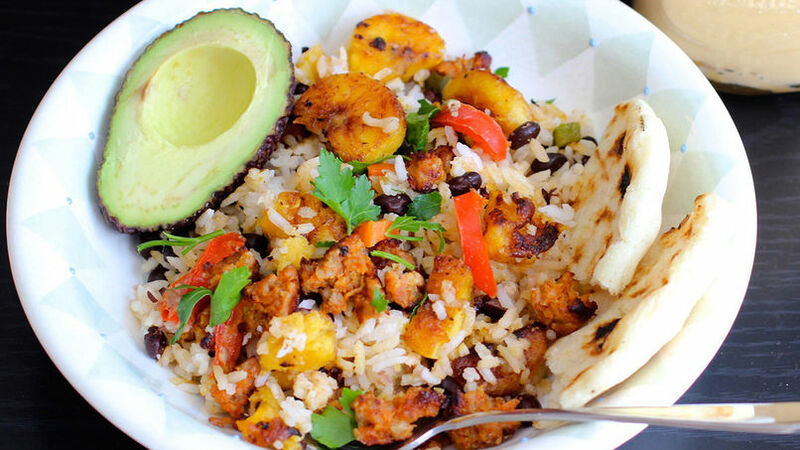 Serve with arepa and avocado. You can replace the chorizo with bacon or pieces of pork. Today, I bring you a Colombian dish that’s super popular in the Antioquia region. It’s an easy and flavorful recipe, and a perfect option when you have leftover beans and rice. Enjoy!